Yes. 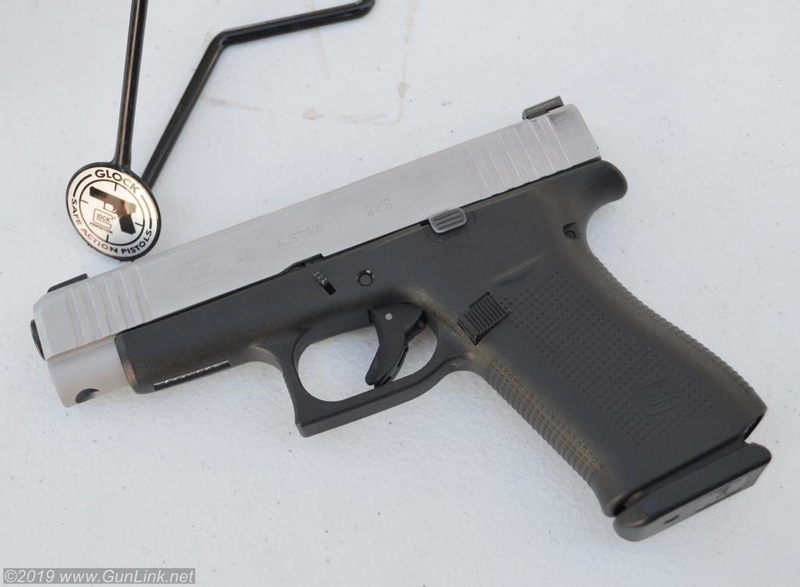 The new G43X and G48 may fall largely into the aforementioned category of “new lipstick on an old pig.” But they’re the pigs that everyone is talking about since they were announced earlier this month. Admittedly, on paper, these new pistols didn’t make much sense to me and I was simply not impressed or interested despite being a daily-carry “Glock Guy” while staying well short of being a Fan Boy. Hey, at least there was more development that went into these than literally just slapping on a new paint job. 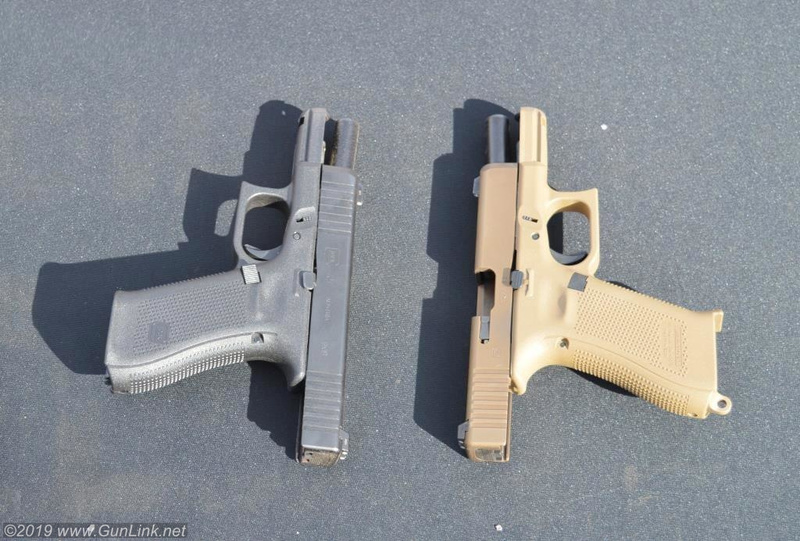 A couple members of the GunLink team got to put some rounds down range through all three of the new pistols – the new 43X and 48, as well as the G45 (a G19 slide on a G17 grip… but now available in BLACK!!) that has been around for a few months. While both of our shooters remained unimpressed with the G43X. I still cannot fathom why one would permanently sacrifice the ability to have a workable deep concealment pistol for the same extra rounds and grip-length you could get with a higher capacity magazine with a sleeve. 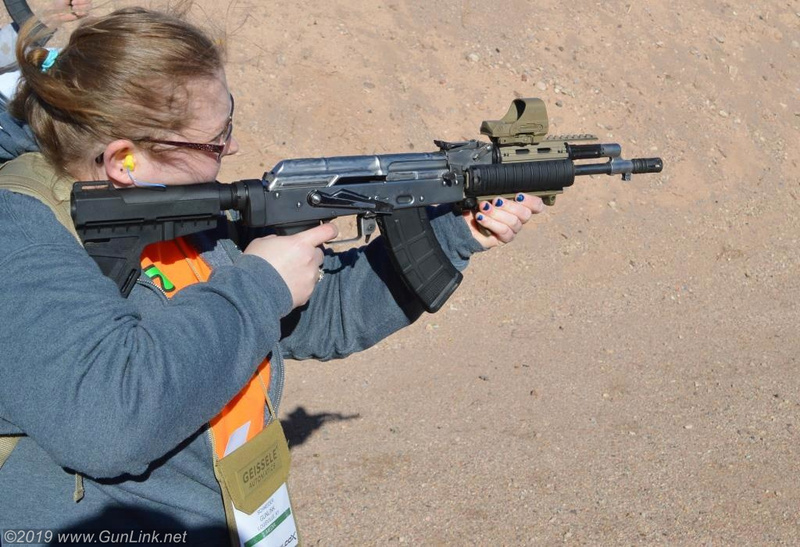 Once she got her hands on the G48, our female shooter liked it just as much as she thought she would (being of the opinion that a G19 grip is just slightly too large). Even I had to admit that it makes a lot more sense in the hand than it does on the spec sheet. The 48 handled nicely, shot well, and would carry well. Keep an eye out for a more in-depth range report on these new models over the next week. Made you look. This four-barreled .22lr derringer is not the new Mossberg pistol that you’re looking for. 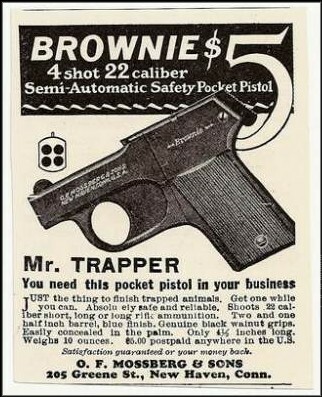 If I knew that Mossberg made the “Brownie” during their first year of operation, that was certainly a bit of information that had escaped me. They cranked out nearly 40,000 of these 4-barreled, rotating firing pin pistols from 1920 to the early ’30s. If that sounds familiar, it may be because it is somewhat similar to Standard Manufacturing’s first iteration of the S-333 Volley Fire handgun that we covered at the 2017 SHOT Show. Hmmph. More on that later in our show coverage. Sadly, this beauty wasn’t on the firing line at Range Day. Here’s what you’re looking for. Because everyone is looking for another sub-compact striker-fired 9mm pistol in 2019. 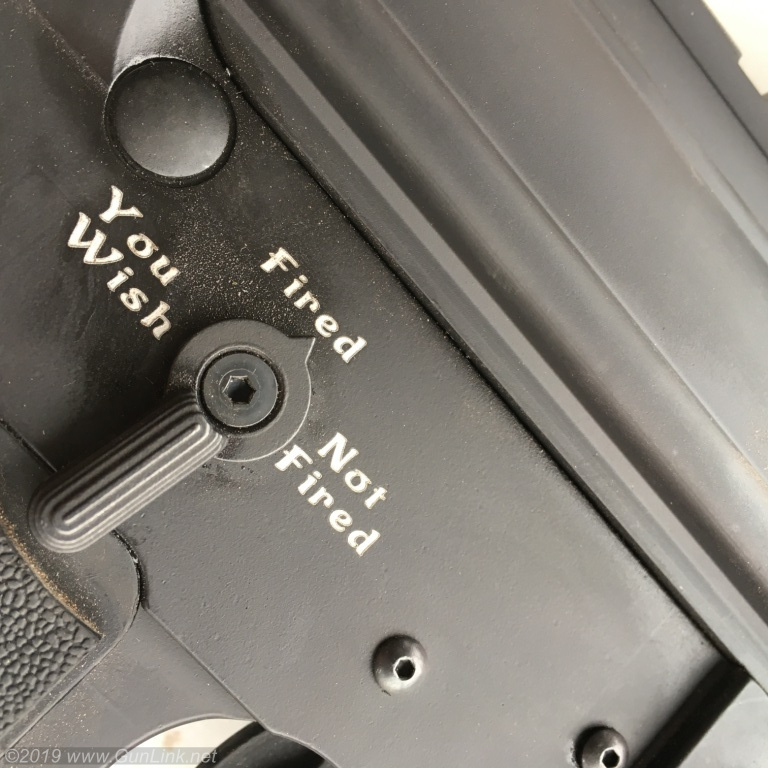 Especially when it comes from a company with such a resounding reputation for creating handguns as Mossberg has. O.F. 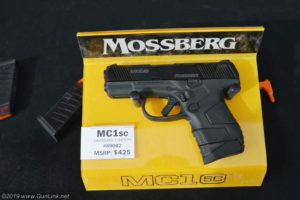 Mossberg & Sons is marking their 100th year in business in 2019, and they are celebrating with the MC1sc pistol. And, aside from a little gentle ribbing, the MC1sc appears to be very well executed. 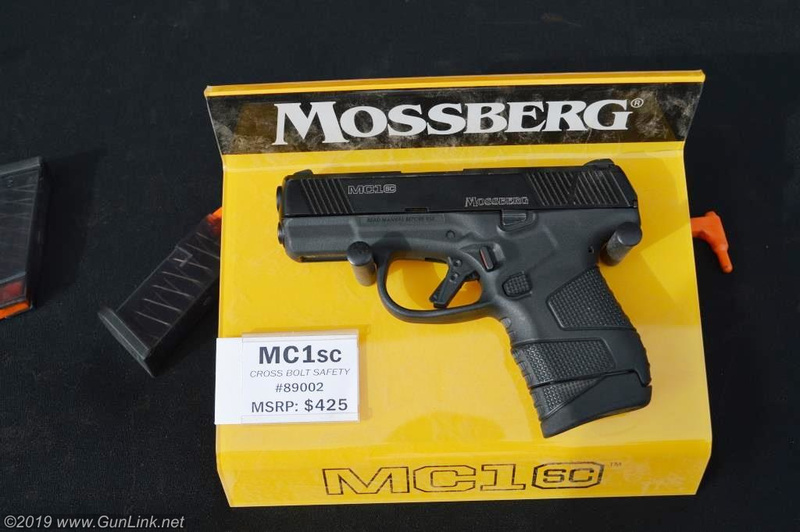 The MC1sc handled well, shot well, looks pretty decent, and won’t break the bank with an MSRP starting at $425. The slide has front and rear cocking serrations, the flat-faced 5lb trigger broke nicely, and while the basic sights are nothing to write home about, they do ride in a pair of dovetails so they will be easy to swap out, or choose the TRUGLO or Viridian options out of the box. Any of those will do fine for a sub-compact 9mm pocket gun. 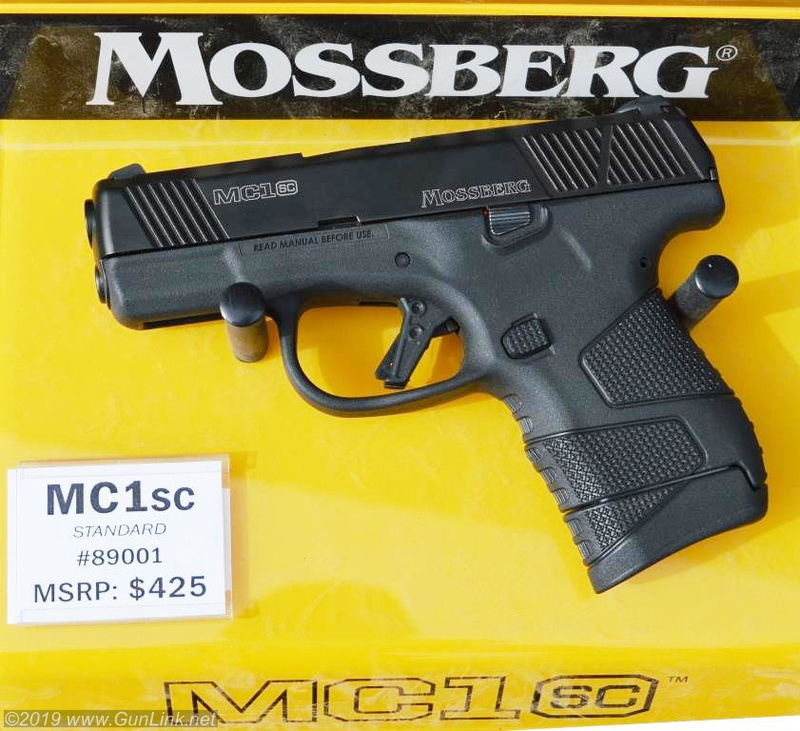 The optional manual safety is not any great shakes either – a simple cross-bolt safety behind the trigger guard that doesn’t disable anything other than rearward travel of the trigger. 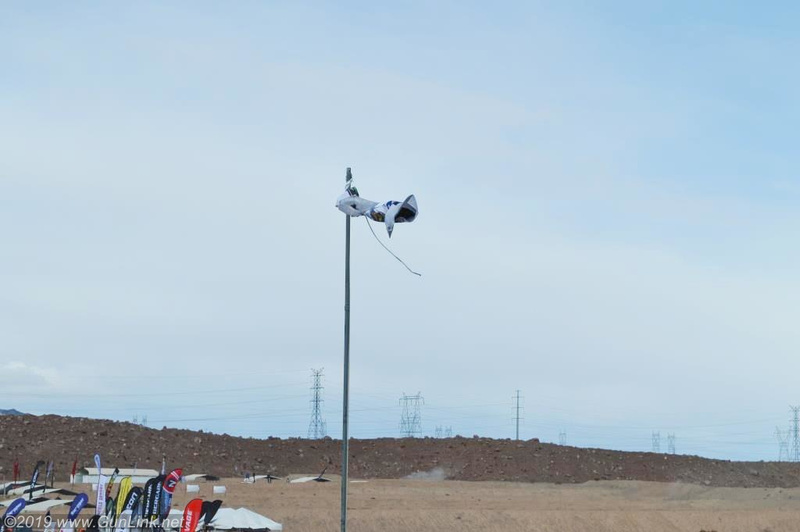 Take-down is incredibly easy and is accomplished from an open-slide and without pulling the trigger. For those worried about ammo capacity of the sub-compact, it ships with one 6- and one 7-round magazine; clear ones that look like they might be from ETS. Bonus: the MC1sc takes the same magazines as a G43. So you can get a higher capacity magazine like the 7-, 9-, or 12-round ETS magazines and have a pocket gun with the option of having more rounds. Like a normal person in the market for a pocket-sized pistol. I’m looking at you, G43X. This is a neat line of pistols and we’ll have a more in-depth write-up on it coming soon. We told you about the new Mossberg Shockwave models back in November. I’ve never been a fan of the “Chainsaw” models, and that hasn’t changed just because they’re doing it to a Shockwave now. However, the overhand grip should be easier to use for hip-shooting with the bird’s head grip than it is with a pistol-grip 500 or 590. 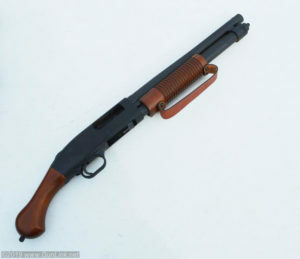 Likewise, the tactical SPX model, while it looks good and probably fills its role nicely, didn’t really do it for our team either, despite having a Mossberg family around here with a decent stable of scatter guns from the 100 year old company. What immediately caught my eye when they were announced and has kept my attention ever since, including on the Range Day firing line, is the Talo-exclusive Night Stick model with wood furniture. The Night Stick looked and felt almost as good at the range as it did in my overactive imagination. I say “almost” because it is lacking two things that I would like to see on it. First, I believe it would look and handle much better with some checking on the hardwood bird’s head grip. Secondly, I was hoping the wood furniture would bring a little extra weight with it instead of keeping it at the exact same 5.25 lbs of the standard model. While I’m complaining about little things, I might as well wish they would have dressed up the leather strap a little with a little tooling or a better oil finish. That doesn’t stop me from wanting this, however. Unfortunately, I don’t see another new Shockwave in our future and it sounds like Mossberg won’t be selling the wood grip and forend separately. And they’re promising that they’re totally not vaporware this time. An aesthetic cross between a Brugger & Thomet USW and something that Rick Deckard would use to whack replicants, the new Keltec CP33 is an oversized (nearly 11″ long and 1.5 lbs empty) .22lr pistol ostensibly aimed at the competition shooting market. The “33” in its name is a nod to the magnificent capacity of the pistol owed to its quad-stack 33-round magazine, which looks like a combination of a regular stagger-stacked rimfire magazine and the rib-down-the-middle PMR-30 magazine. 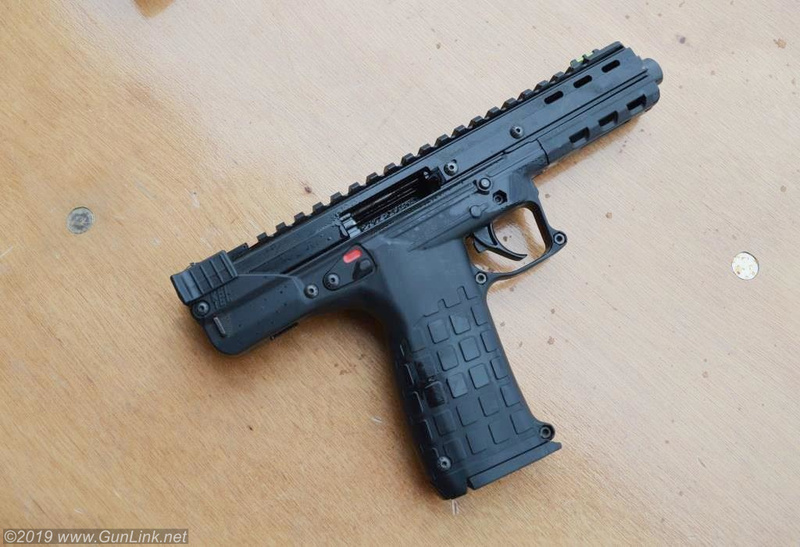 I happen to like a lot of the unconventional stuff that Keltec produces, even if they do sometimes have production hiccups. They folks down in Cocoa are coming up with some neat firearms, and this one definitely got me excited when I found out about it before SHOT. 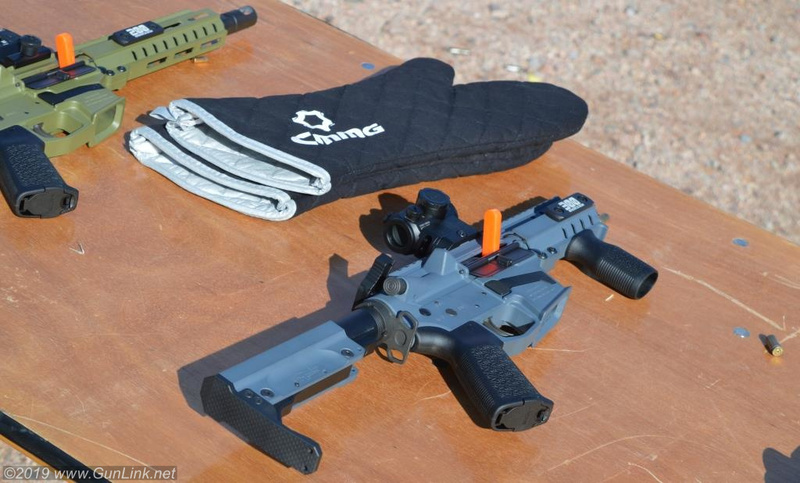 The bolt reciprocates inside of the pistol’s frame, leaving a full-length Picatinny rail on top for those wanting to use an optic instead of the included fiber-optic sights. A 1/2×29 threaded barrel means that it’s ready to have a suppressor threaded on to it. And… 33+1 capacity. I mean, c’mon! The CP33 is just begging to be our next rimfire suppressor host. Or, at least it would be if it runs right. Admittedly, my spirits were significantly dampened once I got to the firing line with the CP33. It was not running well at all when I stepped up to send some rounds down range with it. By that I mean that the optional single-shot mode “feature” had apparently been engaged thanks to a day full of untold Range Day attendees putting thousands of dirty .22LR rounds through it without cleaning. However, after a generous CLP bath by the Keltec guys, it ran like a top for us to quickly and accurately dump the rest of the provided magazines on the steel targets without so much as a miss or a hiccup. The CP33 looks like a really fun, cool target plinking pistol and I think I still want one, but I will probably wait until I get some more trigger time or hear more range reports before plunking down the cash for one. So maybe this one didn’t require a team of astrophysicists working tirelessly around the clock to engineer, but Keltec has made a pretty substantial change to their KSG bullpup shotgun. 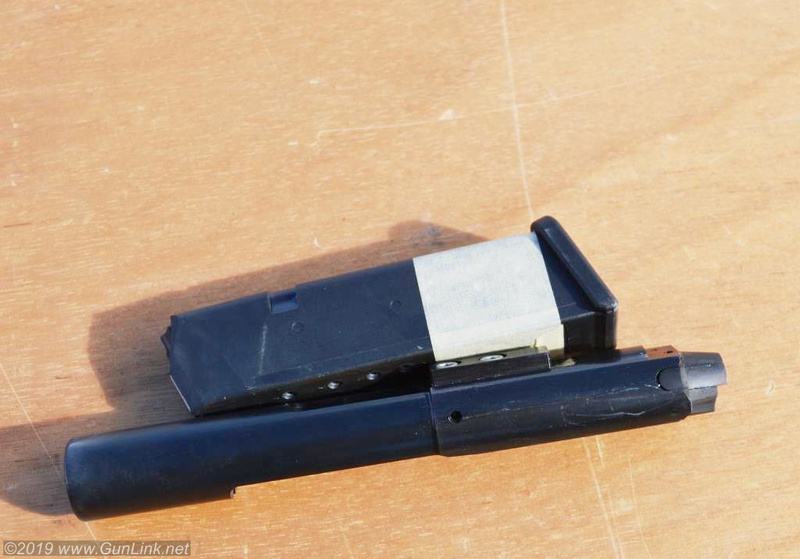 Keltec trimmed a full off of the original model by losing one of the KSG’s dual magazine tubes. 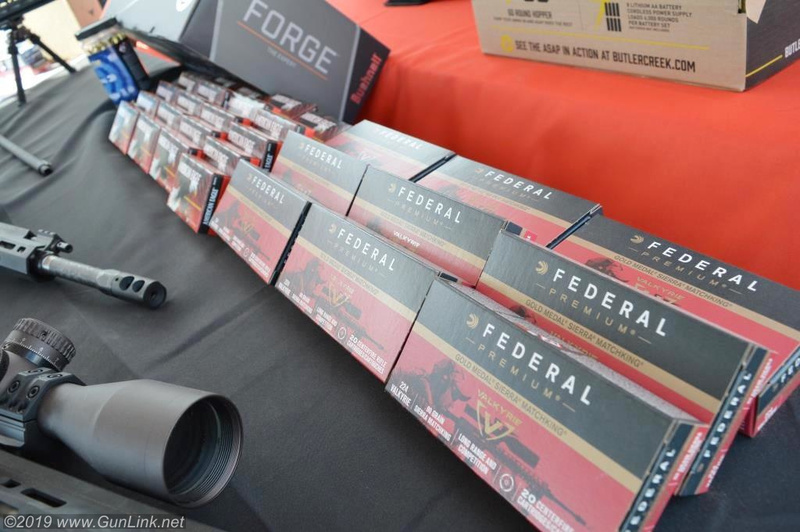 This allowed for an end-to-end makeover of the feeding system, pump action, and stock. The loss of the magazine tube is a bummer for the round-count-is-everything crowd but, thanks to the bullpup design that allows the remaining tube to stretch further than a conventional shotgun’s, the new KS7 still boasts a 6+1 capacity for 3″ shells in its compact 26″ overall length package. We got to shoot the KS7 at Range Day and, other than the more comfortable cheek weld made possible by the carry-handle mounted sights, it handles and shoots pretty much exactly like its big brother. You won’t hear us complain about that; these are fun little scatterguns. 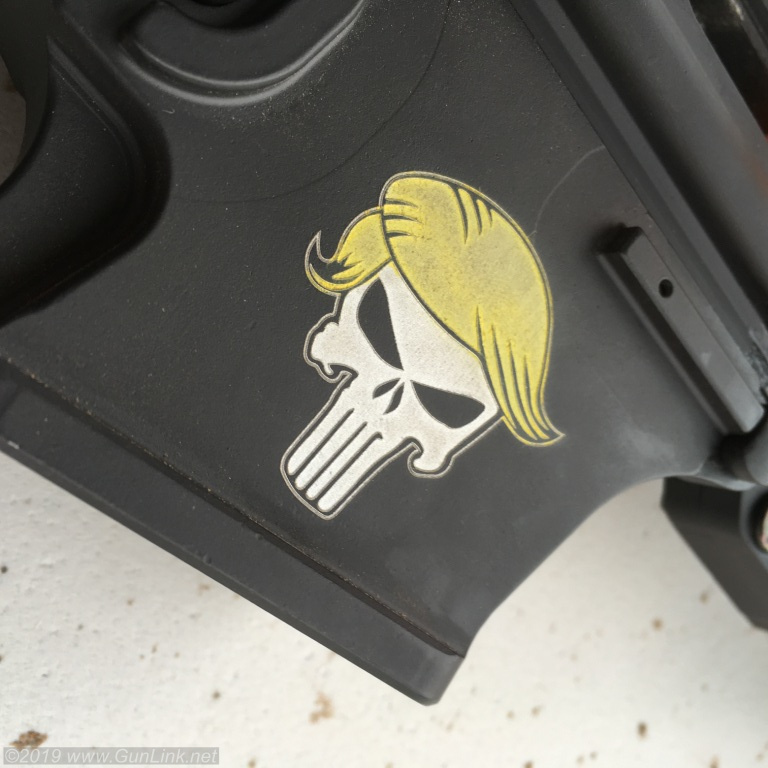 The folks at Fight Light always bring some great toys out to SHOT Show Range Day. Good for shooting, maybe not so good for paying attention to stuff. 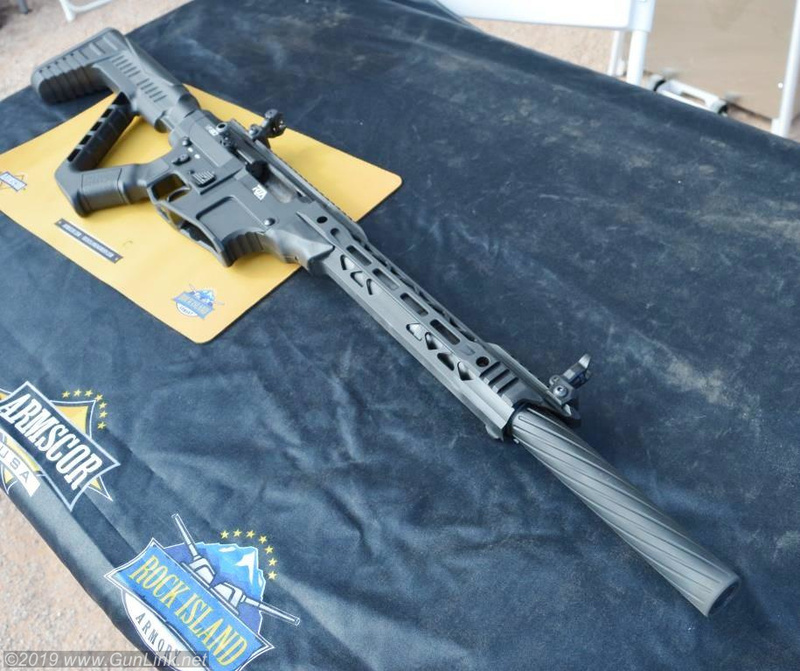 At last year’s Range Day, we were so excited to play around with the 5.56 SCR rifle and Raider pistol with their articulating bolt carrier that allows a traditional style stock or bird’s head grip on an AR, that we didn’t get a chance to fully enjoy their Mission Configurable Rifle (MCR). The MCR is Fight Lite’s piston-driven, quick-changing barreled rifle that feeds from standard AR magazines or M27 linked ammo. 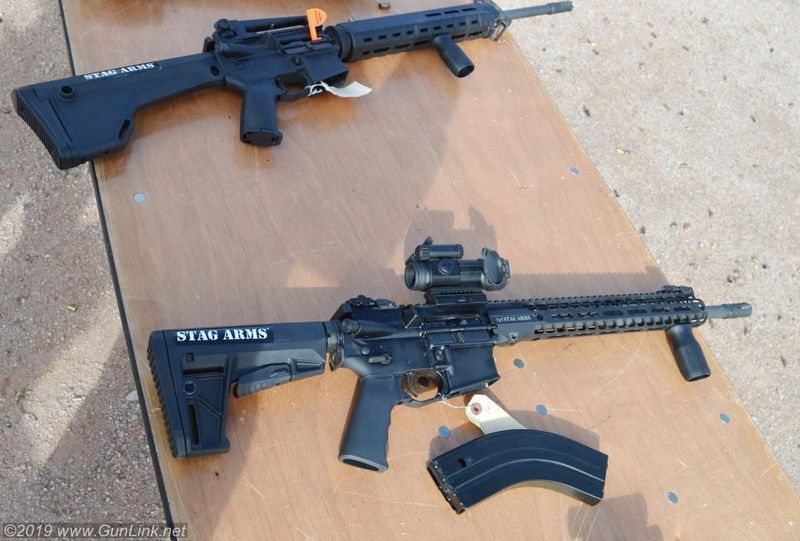 And, of course, since it is SHOT Show Range Day, they were showing off their select-fire version. 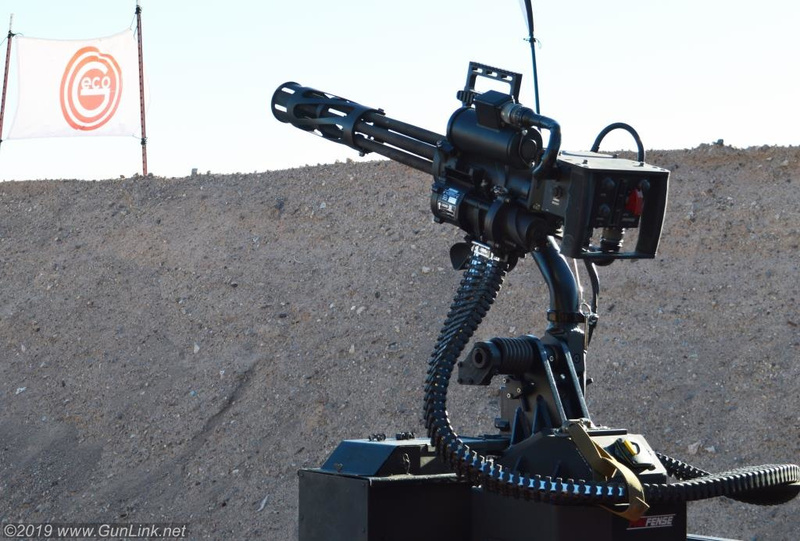 We didn’t make the mistake of missing out on MCR live fire again this year. But, alas, the pattern continued. Despite Fight Lite’s big news this year being the much anticipated release of the MXR, first announced in 2017. The MXR sub-gun is entering the booming consumer pistol caliber carbine (PCC) market and bringing with it a number of features that PCC shooters are looking for. Much like many other PCC offerings out there, the standard MXR is chambered for 9mm and takes Glock magazines. 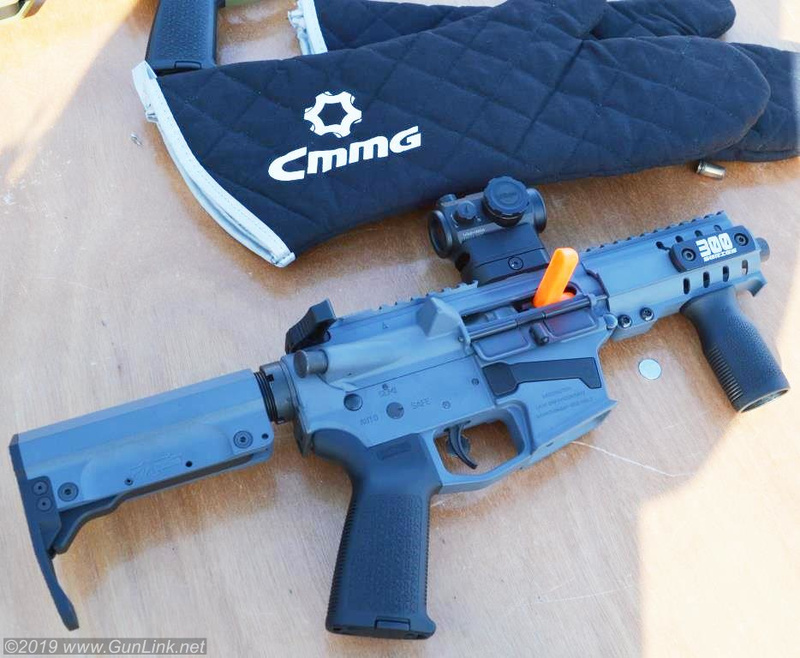 The real story is that the MXR allows tool-less caliber conversion via a barrel swap to .22lr, .40S&W, .357 Sig, .45ACP, 5.7×28, among others. Not only can the MXR hop calibers, it also incorporates magazine adapters allowing the shooter to match their SMG magazines to their carry pistol including Glock, Sig, Beretta, Smith & Wesson, CZ, and more. Continuing our Fight Lite coverage pattern, it looks like we’ll have to bring you more photos from the SHOT Show floor and a live-fire after action report next Range Day. 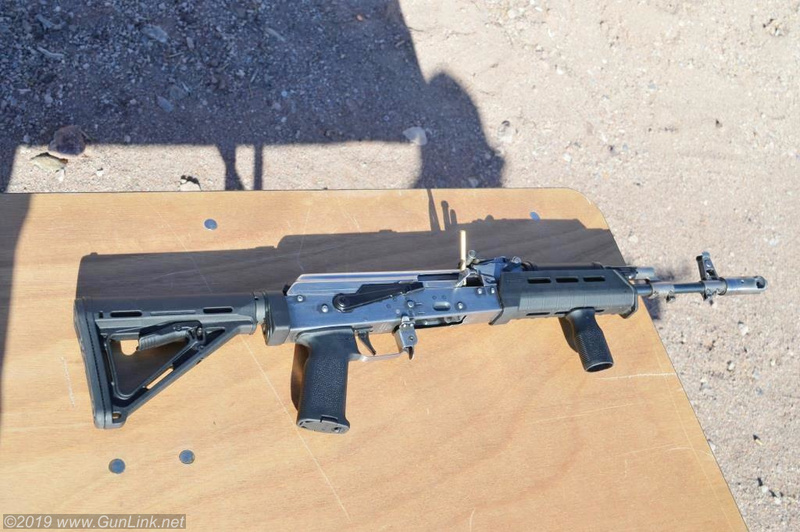 RIA has done swift business with their chunk VR60 AR-esque semi-auto 12 gauge shotgun. 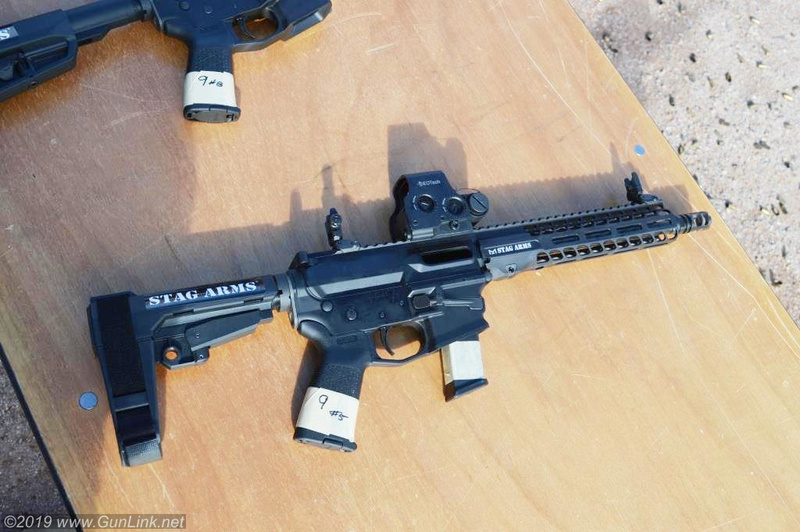 Swift enough, it seems, that they are now selling another AR-pattern that appears to be a rebranded firearm from the same Turkish manufacturer. 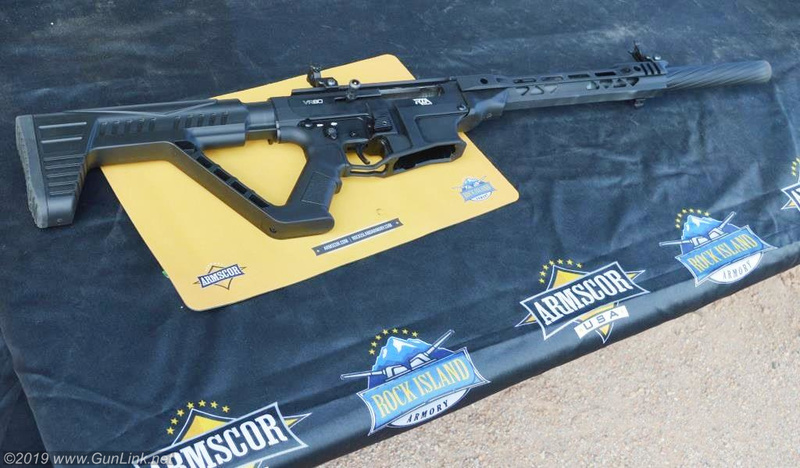 The “new” Rock Island VR80 from Armscor looks to be a Derya Mk12 shotgun, which has proven itself to be reliable enough to be a contender in IPSC and other sport shooting competitions in Canada and abroad. 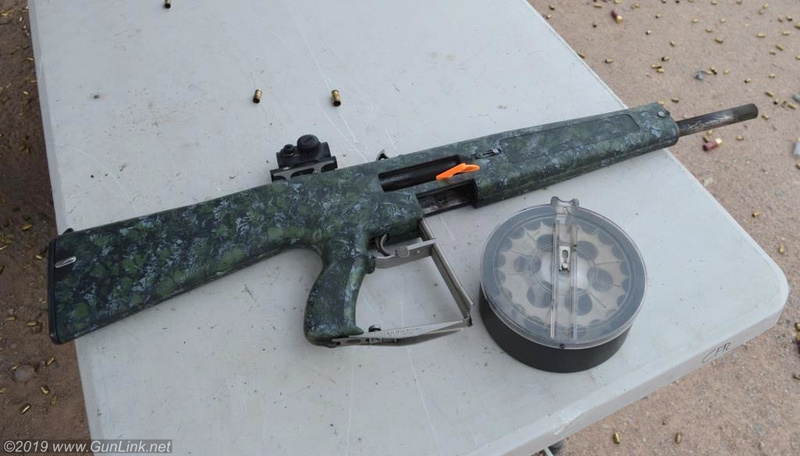 I ran a magazine or two through the VR80 at Range Day and, for what it is, it is a pretty nice shotgun. While the factory thumbhole stock is an abomination surely there only to get the nod from some import bureaucrat, its attachment points on the shotgun are the same as a standard AR-15 grip and stock’s attachment points, so the parts would be interchangeable. 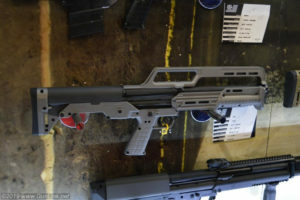 Aside from that extra piece of material on the stock that will, no doubt, increase safety and save countless lives, the ergonomics and controls should be well familiar to anyone who is used to those of any other Modern Sporting Rifle, from the magazine and bolt releases to the fire controls to the basic takedown process. 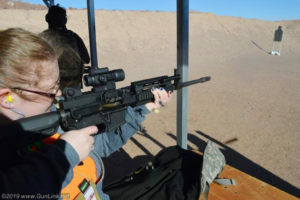 While you shouldn’t expect 5.56 AR recoil out of the 12ga “AR” shotgun, felt recoil was not bad at all and follow up shots were easy to manage. With an MSRP of $699, the VR80 starts out a couple hundred bucks higher than its fat VR60 brother, albeit an inch longer and nearly a pound heavier despite its much cleaner lines and less chunky feel. I definitely don’t need one, but I kind of want one. 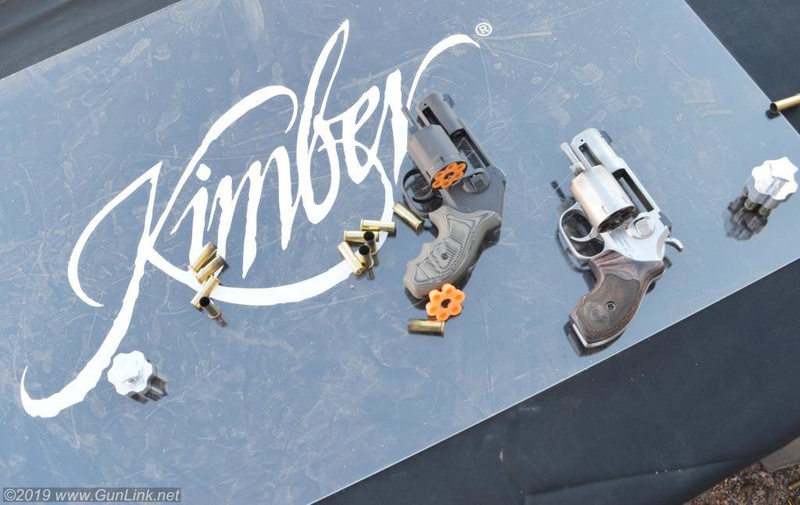 Straying outside of their normal firearms production path, as they did at the 2016 SHOT Show when they first introduced the K6s revolver, Kimber is once again breaking their own mold and joining the likes of Mossberg by making a new entry into the arena of compact striker-fired 9s with their new EVO SP (for Striker Pistol) model. 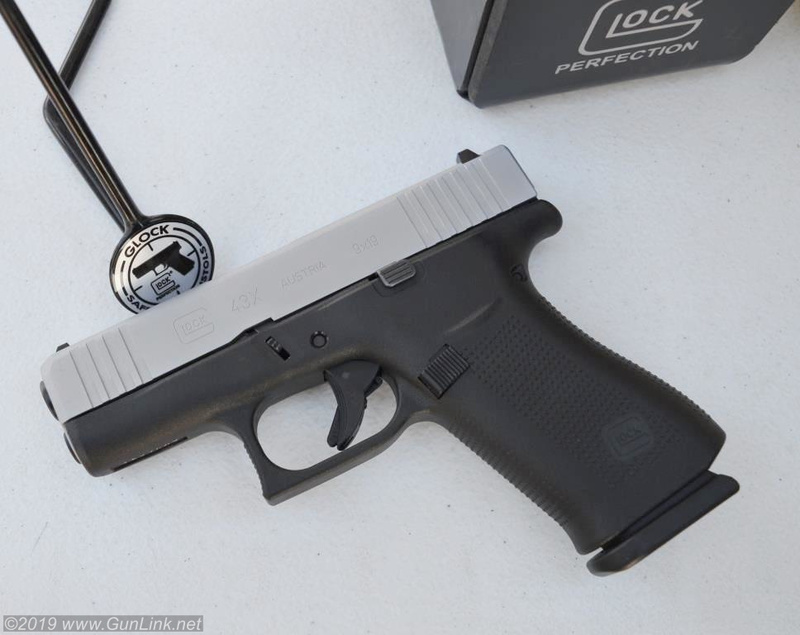 Despite the metal frame, the EVO SP weighs in ounces lighter than nearly every other competitor, including the G43, Shield, and new MC1sc (but not the P365). The aggressive grips (which comfortably lack external hardware) make the pistol easy to hold on to despite its smallish size. It shoots as well as you would expect a Kimber of this size to shoot and with Kimber’s attention to detail and craftsmanship comes Kimber’s price tag ranging anywhere from $860-1050. I’ll be a hard pass on this one, thanks; but if you’re solidly in the Kimber camp and want to change things up, this might bring your carry setup into the current century. 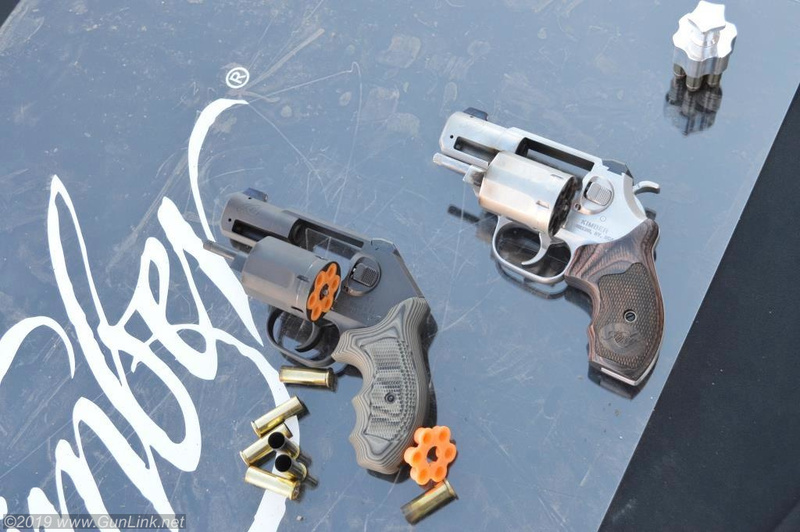 The company also tweaked the K6s revolver line by adding an exposed hammer spur and single/double action to what was once a DAO revolver and making what was already a nice shooting wheelgun even nicer shooting. 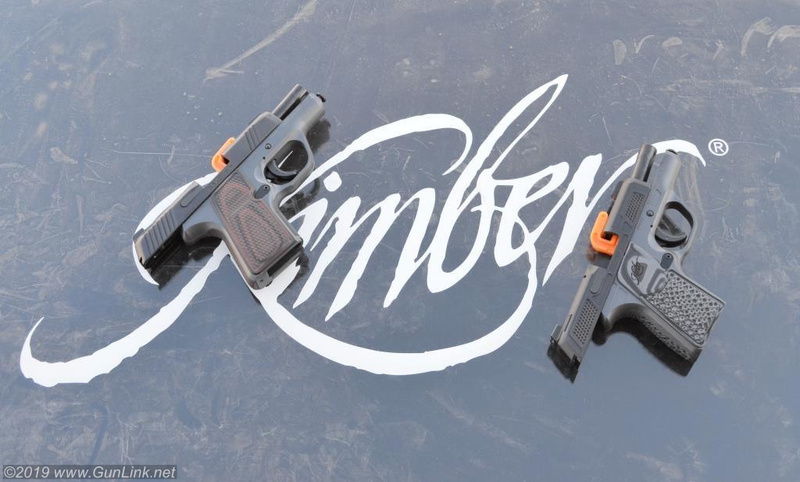 I certainly didn’t mind when the Kimber rep kept offering me additional speed loaders to run through it! 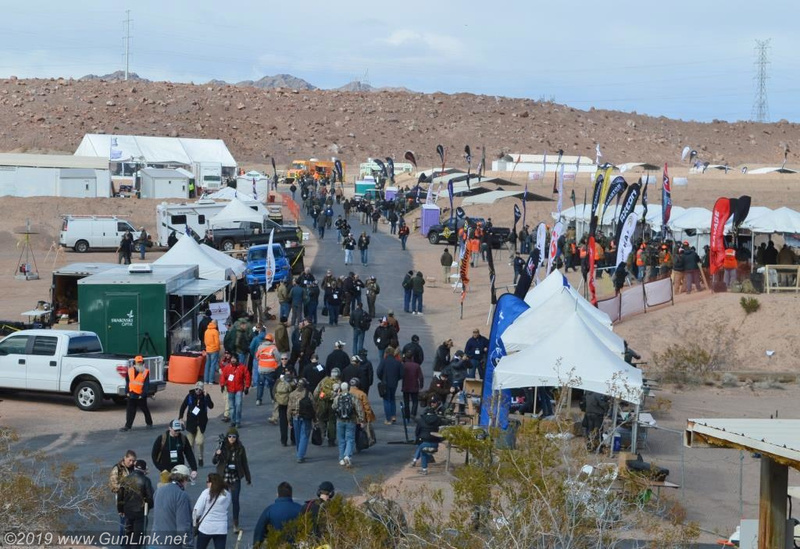 While we saw a lot of interesting stuff, firearms related or otherwise at the show, much of it is better served by being detailed in separate posts here or over on the GunLink Forums. 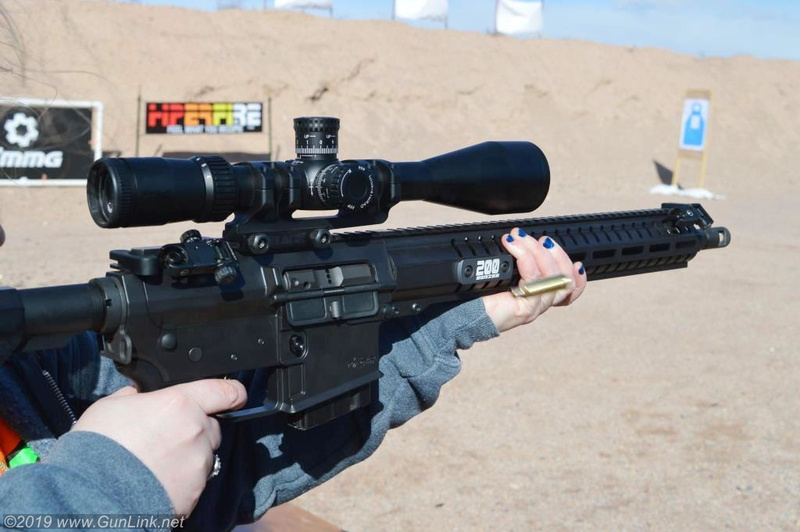 We got to take some shots under Brownell’s new in-house glass, the Match Precision Optics (MPO). Available in 3-18×50 5-25×54 powers with 34mm tubes, the new scopes feature Japanese glass and mechanics. Both first focal plane scopes feature what they call the N-OMR (Non-Obscuring Milling Reticle) so, as you zoom to higher power, there is a small visible gap dead center of the reticle, allowing you to see exactly where you are aiming rather than obscuring it with crosshairs. They appear to be a lot of scope for right around $1k. 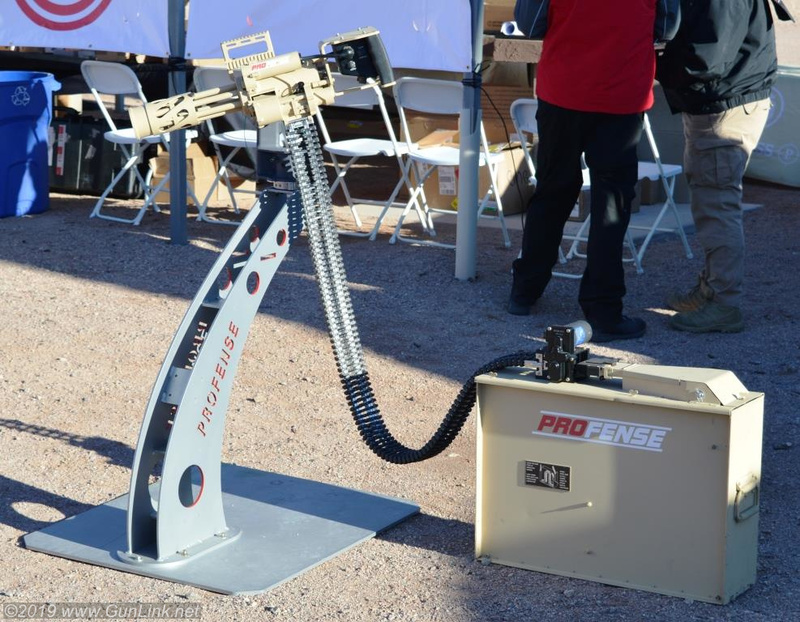 Franklin Armory was at Range Day but, as they did last year, they kept mum about their latest secret gizmo – the Providence – opting instead to make everyone wait until tomorrow to see it in their show booth. They do, however, assure us that it is quite revolutionary. 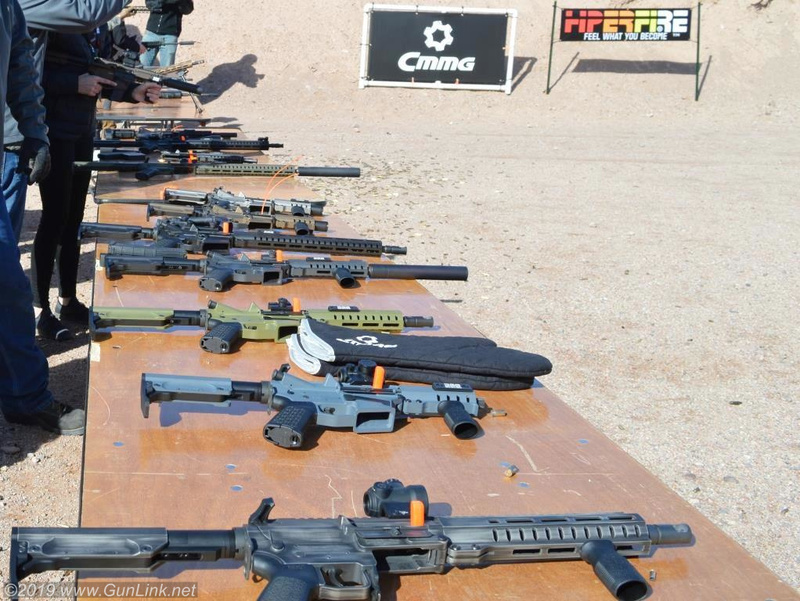 CMMG was quite generous with the loaded mags on their firing lane so we got to sample a little bit of everything. 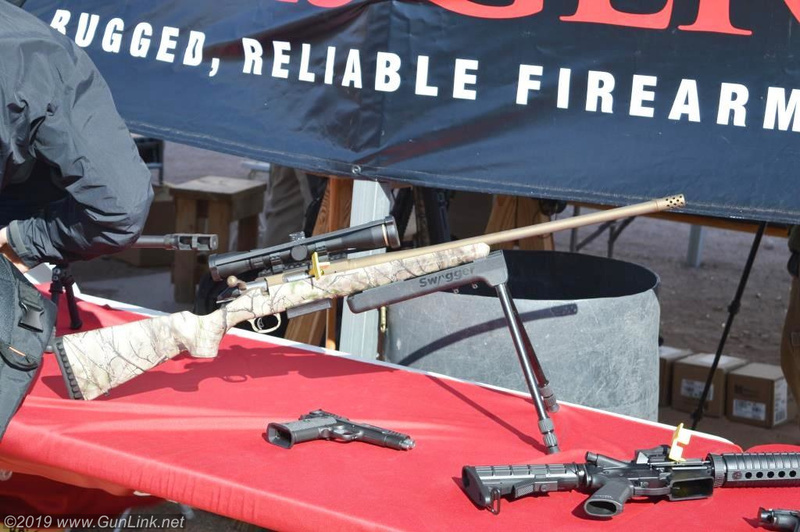 They had their newly renamed rifles and AR pistols on the firing line, including the new Banshee chambered in 5.7x28mm that takes FN FiveSeven magazines as well as the pistol brace version of their RipsStock. We also ran some obligatory rounds the original Mutant, which they said is now in the neighborhood of 100,000 rounds on all the original parts. 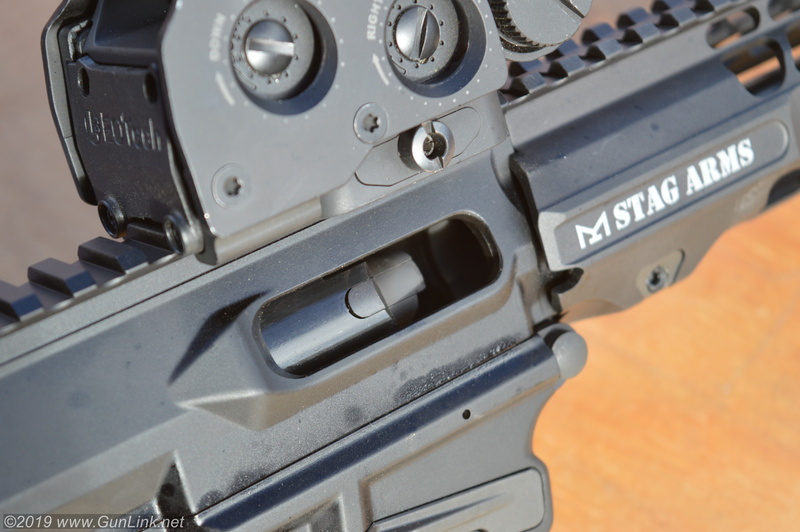 Stag Arms let us try out their new feature-rich 9mm PCC – fancy tapered bolt and all – along with a few other toys they brought along. We made a play date to swing by their booth and take a closer look. At the Buck Knives tent, we threw some hatchets, knives, and rings (?) to win a pair of new knives, which – as a big knife guy – was exactly what I needed. The 110 Slim is a new take on one of their older knives; nothing fancy and I’m not a huge fan of lockback knives, but it is a good, US-made utilitarian knife that will see some use. The other knife, however, really strikes my fancy. The brand new 840 Sprint is a slim, lightweight liner-lock folder with a flipper on the spine (and no thumb-stud) with what I believe is a ball-bearing system that allows for one-handed opening as fast as my assisted Kershaws without any wrist flipping. It’s going directly into my pocket. 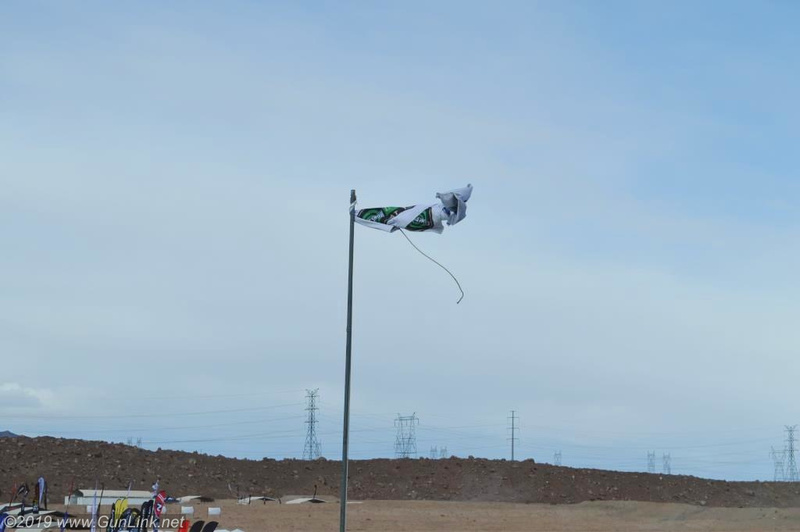 SHOT Show Range Day was a great time and we got to see and do some interesting stuff that we can’t wait to share with you. 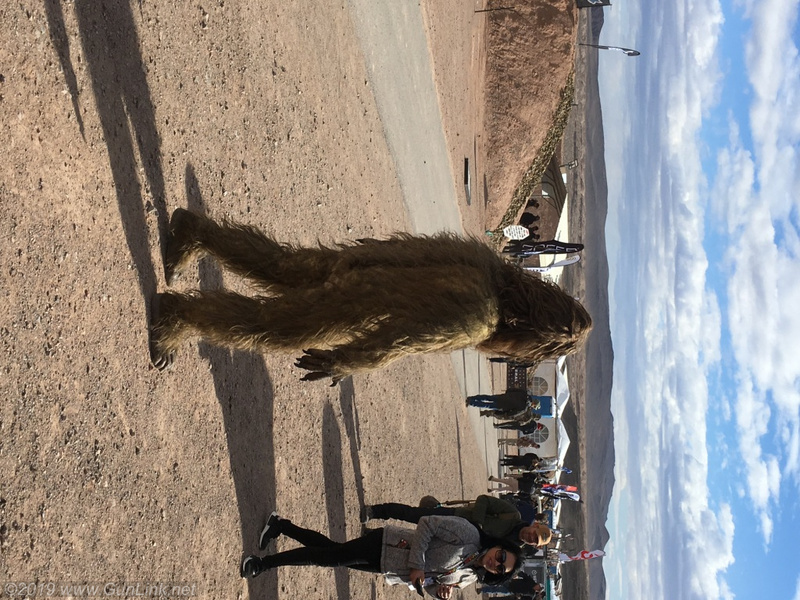 We got to tear through the desert in the new RAM 1500 Rebel truck, throw knives and hatchets, blast away with an AA12, and – I’m not gonna lie, it got a little weird – we saw Sasquatch. We met with they guys from United Defense Corp., who are trying to bring the high-end AR market feel to the AK platform and, although we didn’t get to send any rounds down range with the minigun we played with, we did get to live vicariously through the Profense rep who may singlehandedly keep ammo companies in business. Definitely stay tuned over the coming days and weeks as we bring you more news about what is coming down the firearms pipeline.